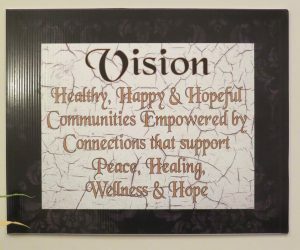 The Peacetree Center for Wellness incorporates a broad range of services under a single roof. The Center sprang from a vision for a place where people and families could be helped and nurtured in a broad range of needs. It is the vision of Katrina Jefferson, our Featured Entrepreneur. Building on her years of experience in social service agencies, Jefferson saw how agencies can suffer from the limitations of a too-narrow focus. Her vision was for a single location where mind, body, and spirit could grow, flourish, and heal in a family atmosphere where young and old worked, played, and learned together. Jefferson had excellent professional credentials as a social worker(Marshall University and West Virginia University with specialties in play and trauma therapy), but, on the recommendation of a friend, saw the benefit of the Planning for Profit class offered by Unlimited Future(UFI). She remembers learning with instructor Ursulette Huntley about how the business and administrative aspects of such an enterprise are very different from the enterprise itself. She learned how even a top-quality product or service can be derailed when necessary business practices are neglected. The UFI class is well-known for helping new businesses find their best path and avoid the pitfalls that often hinder their success. Unlimited Future congratulates Katrina Jefferson, our Featured Entrepreneur. For information about how Unlimited Future can help you realize your vision for a new business, contact Ursulette Huntley, Program director at 304-697-3007.